Strengthening, stimulating and cleansing. This essential oil is obtained from the leaves of the popular culinary herb that has been used for enhancing the flavour of sauces and seasonings for thousands of years. Included in massage blends, Laurel Leaf Essential Oil has a stimulating action on the digestive system that energizes a sluggish digestive system and eases flatulence. When vaporized or inhaled from a tissue, this essential oil can be helpful in maintaining a healthy respiratory system during the cold season due to its substantial antiviral qualities, and in massage it helps to boost the immune system, ease muscular aches, and soothe sprains. 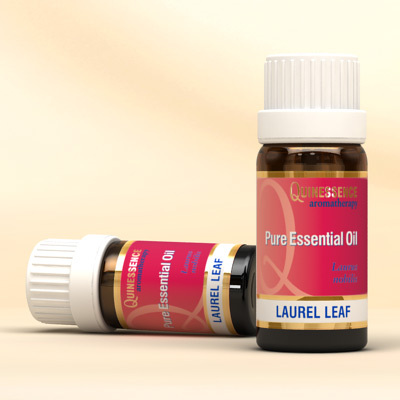 Laurel Leaf Oil has a fresh, sweet and spicy-medicinal aroma that is often preferred to the eucalyptus types used as an inhalant oil. Historically, laurel leaf was the symbol of victory to both the Greeks and the Romans who considered it the herb of protection. This is reflected in the use of Laurel Leaf Essential Oil for instilling confidence and courage as well as improving memory and insight. This oil should not to be confused with bay leaf oil (Pimenta racemosa), which has quite different therapeutic properties.